iPod 10th Anniversary: To celebrate the iPod’s 10th anniversary on Sunday October 23, we’ve been running several special features which we hope will allow our readers to look back at Apple’s most iconic product with fun and fondness. Over the last ten years, the iPod has gone from a single device designed to hold your MP3s to a family of devices that have literally revolutionized the music industry. 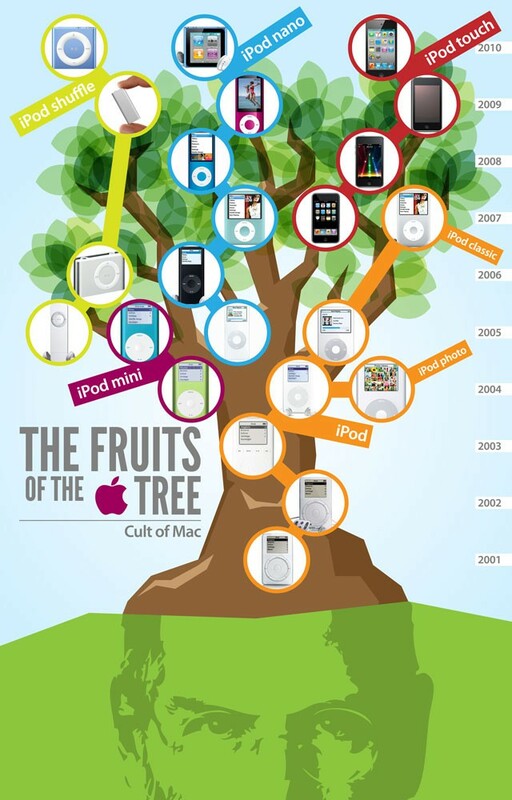 As part of our iPod 10th Anniversary Celebrations, we put together this family tree infographic so you can look back at all of the iPods that have come before, and helped get us to where we are now: the future of digital music. Feel free to repost this graphic, but if you do, please make sure to link to Cult of Mac. Thanks!